The A.Y. Jackson Trail depicts the final years of Jackson's career that were spent mainly in Eastern Ontario when he moved to his niece's home in Manotick in 1952 and later to MacLaren St. in Ottawa. During these years A.Y. made regular fieldtrips in the Ottawa-Gatineau region, mainly with his artist friend Ralph Burton. 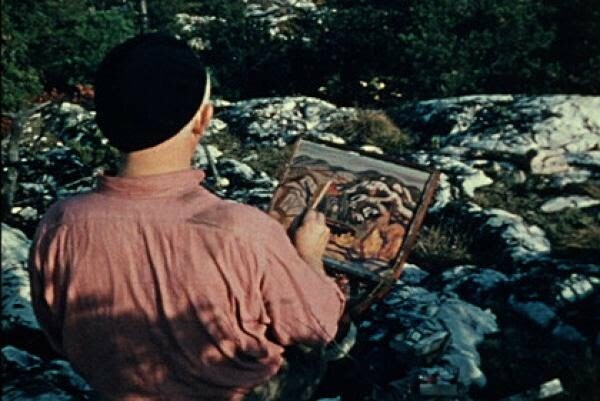 Some fifty years later, two contemporary Lake Clear artists have traced Jackson’s travels using actual paintings, titles, notes and personal experience to locate the painting sites for some of his sketches. Kathy M. Haycock is the daughter of Maurice Haycock and John Almstedt painted with Ralph Burton from 1967 to 1983, both undertook the challenge of locating some of the sites for "now and then" landscape comparisons and to learn more about A.Y's assessment of subject matter. As of autumn 2012 several sites have been located, 4 are illustrated in the below map with accompanying numbered pictures. Travelling the backroads along The A.Y. Jackson Trail provides a feeling for what A.Y. likely experienced as he scanned the countryside for interesting lakes, fields, farms, hills, forests, rivers and creeks with an artist’s appreciation of the composition, colour, form and rhythm before him. He painted a great many sketches in the area, most are still waiting to be rediscovered. Everyone who follows The A.Y. Jackson Trail will have a different unique and rich personal experience. Students, artists, residents and visitors alike may admire the landscape with a fresh perspective. Whether you engage in photography, painting, drawing or writing, you can immerse yourself in the muse that inspired A.Y. Jackson, his painting companions, and the artists who have followed. Jackson made a great contribution to the artistic appreciation of the region. He recognized the incredible beauty in the Madawaska Hills and through his many paintings he brought it to the attention of the world. Now others can discover and appreciate the astonishing diversity and splendor of some actual painting sites and the surrounding landscape that attracted him. A.Y. Jackson paintings reproduced courtesy of the Estate of the late Dr. Namoni Jackson Groves. Photo credits: Kathy M. Haycock.